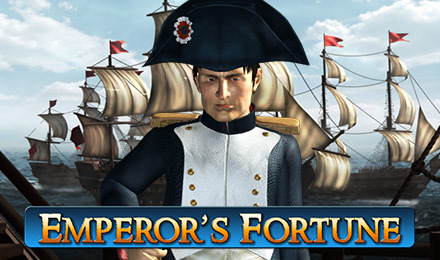 Play Emperor's Fortune Slots with FREE Spins & more! With a 95% RTP, FREE Spins and a Prize Pick Bonus, Emperor’s Fortune Slots is irresistible, so get ready for a deep sea adventure! Good luck! Do you have what it takes to sail the seas and claim your treasure? Play Emperor’s Fortune Slots to find out! Napoleon is your Scatter, and when 3 or more appear across the reels, your FREE spins will be triggered. During this bonus, all line wins will be tripled! Be sure to look out for the Canon symbol as well, because when you spin 3 or more, your Prize Pick Bonus will begin and you can multiply your wager up to 100x!